Panthers captain Ulrich Ostergaard has set his sights on another Premier League Riders’ Championship podium finish. 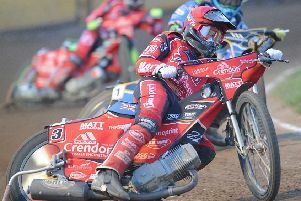 The Danish ace roared to third place in the annual individual showcase back in 2014 and is confident of delivering another good display at Sheffield on Sunday (5pm). Ostergaard was not included in the original line-up as Robert Lambert was the club’s number one at the time the PLRC field was put together. But the club’s decision to sack the teenager in favour of signing Ben Barker meant Ostergaard returned to the top of the averages. Premier League Riders’ Championship line-up: 1 Ulrich Ostergaard (Panthers), 2 Richard Lawson (Glasgow), 3 Nick Morris (Glasgow), 4 Rohan Tungate (Ipswich), 5 Steve Worrall (Newcastle), 6 Craig Cook (Edinburgh), 7 Ricky Wells (Workington), 8 Sam Masters (Edinburgh), 9 Matej Kus (Redcar), 10 Thomas Jorgensen (Berwick), 11 Brady Kurtz (Somerset), 12 Jason Garrity (Sheffield), 13 Josh Grajczonek (Somerset), 14 Alex Davies (Scunthorpe), 15 Kyle Newman (Plymouth), 16 Edward Kennett (Rye House).